Hi! Kris and I are deep into our 3rd annual Summer Movie Fantasy League, so I thought it might be time for an update. I came out of the gate strong, with Fast & Furious 6 nabbing almost $100K, but it was all downhill from there. World War Z did pretty well, but my poor choices of After Earth, Epic, White House Down, and Turbo did me no favors. Meanwhile, Kris picked the single biggest film, Man of Steel, plus got the two biggest kiddie flicks, Monsters U and Despicable Me 2. With three movies left for each of us, things are looking grim for the former champion (me). However! All is not lost. 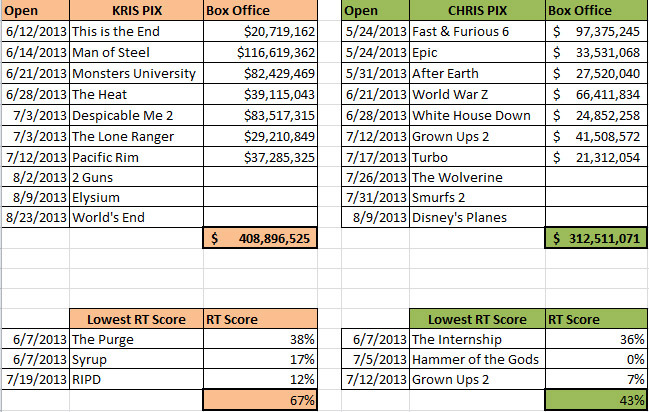 With a string of crap and duds hitting the theaters over the past few weeks, and The Wolverine basically opening without any competition, I could cut a hefty chunk out of Kris’ $96 million lead this weekend. Unfortunately, I doubt it’ll be enough to win. She still has Elysium, which 1) has been advertised like crazy, 2) looks like it might be good, and 3) MATT DAMON. I’m not sure how 2 Guns will do, but it’s got Denzel Washington and Marky Mark, so I assume it’ll have a healthy opening. I think I’m still gonna get beat, but maybe it’ll be close. Meanwhile, our three film picks for lowest Rotten Tomato score was close for a while! The Purge and The Internship were both basically the same degree of stinky. Kris looked like she might have run away with it by picking Syrup, which had zero positive reviews for WEEKS, but suddenly a positive one appeared, knocking it up to 17%. I managed a 0% pick too, with Hammer of the Gods, but we’ll have to keep an eye on it in case some tool decides to like it enough to give it a decent review. R.I.P.D. was much-hated, but not as much-hated as the most-hated Grown Ups 2. As with Syrup, these scores tend to fluctuate a bit as late reviews come in throughout the summer, but right now, I think I’ve got this portion of the summer league won. Do you mean 100 mill?